I loved Samantha and Lee’s 4 tier cake that we delivered to The Reid Rooms in Dunmow on Sunday 19th August. 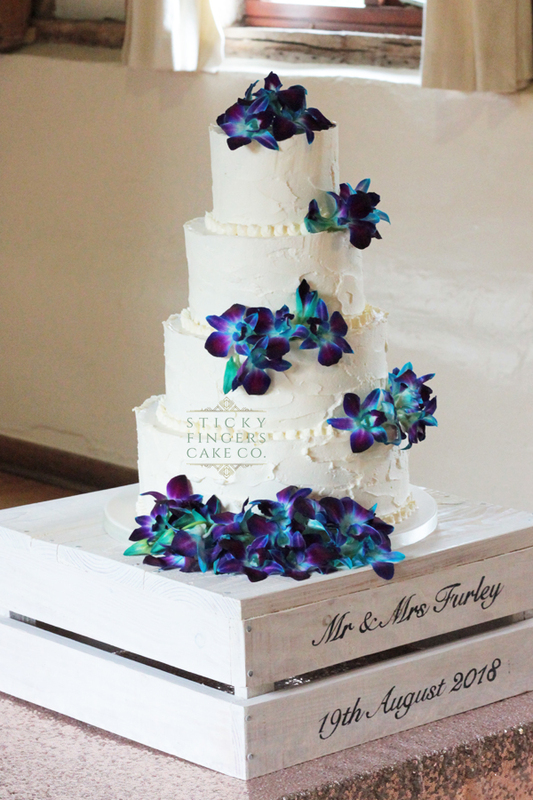 They wanted a rough textured buttercream wedding cake which sat perfectly in The Reid Rooms barn and I decorated it with some striking blue and purple “Singapore” orchids supplied by their florist. Deliciously gorgeous flavours of Strawberry & Champagne, White Chocolate & Passion Fruit, Cherry Bakewell and finally Lemon Drizzle – their wedding cake was being served as dessert so brilliant flavours to choose! This wedding cake has to be one of the most “Liked” and clicked-on pictures I’ve posted on social media which isn’t surprising as it really is so beautiful. Sending you both such huge congratulations on your wedding and I hope you have a long and happy life together!